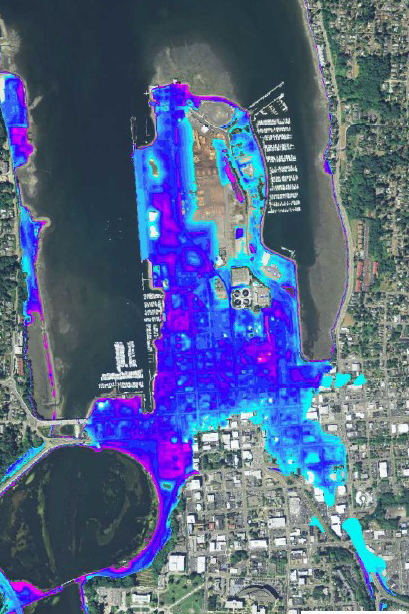 Sea level rise has been a doing discussion in Olympia for the last few years, and to this point, we seem pretty clear on the implications. At some point, the last century of working towards reaching towards the deep water will be reversed in Olympia. Much of Olympia's history has been defined by expanding our shorelines, slowly replacing 4,000 foot long wharf with dry land. 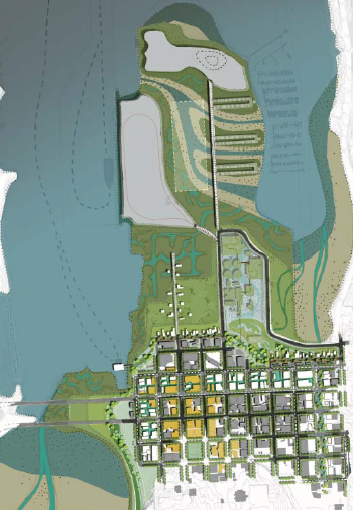 The most facinating thing I've read about the future/past of Olympia's shorelines has been a master's thesis from a student in California. It really is a beautiful thing. The thesis by Brenda Lorene Snyder in urban design at University of California, Berkeley is fascinating. 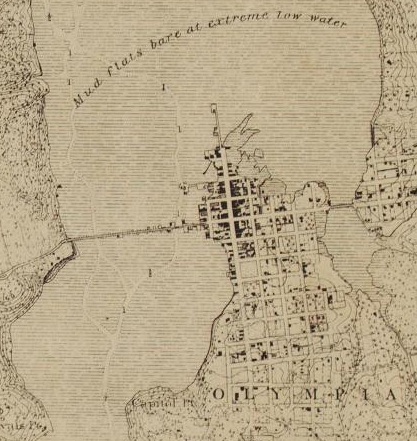 Snyder does a great job laying out the natural and built history of Olympia and Puget Sound. But, the meat of the thesis, the picture of Olympia after a century of sea-level rise starts here. Off the top, she assumes the restoration of the Deschutes River estuary. Despite some city maps that imply saving the lake, her vision simply allows for an open estuary with little if any discussion. Aqua blocks. Snynder proposes creeks running through several current alley ways to deal with stormwater runnoff. Replacing the historic long warf with an extended Capitol Way with artisan structures over water. After perusing Creek Street we turn right onto Legion Way SE, headed towards Olympia’s historic town square, Sylvester Park. Significant growth has occurred within the downtown neighborhood over the past decades and Olympia has been able to manage this growth to its own benefi t. Strategic infill has strengthened the continuity of its human scale walk-able blocks. Through thoughtful design and attentiveness to the scale and style of historic structures Olympia has been able to maintain and strengthen the character of livability it’s become known for - a cozy yet lively village tucked away along the shores of the Puget Sound. 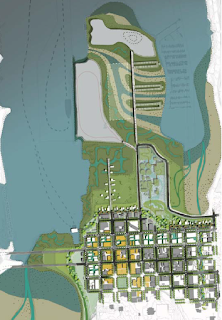 Despite the birds eye view seeming like this is a proposal to walk back from the impacts of nature, the closer in look shows a much more balances approach. She does propose a long berm (hidden as a new urban street) to protect downtown blocks. But, at the same time, she proposes using urban design techniques to provide clean water. She also protects our deepwater port. But, this certainly isn't slapping up bare earth berms and hard walls to protect the blocks we have now. This may not be exactly what we end up doing, but this is the kind of beautiful urban design we need to approach the hard questions we'll have to answer in the next century. We have to be able to see the solutions before we make them happen.